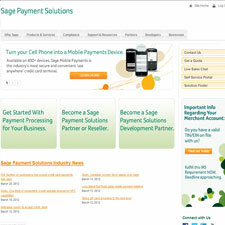 Sage Payment Solutions offers credit card processing for transactions online, at a physical business location or over the phone or mail. They offer merchant account origination services as well as payment processing software and tools. Accepting all major credit cards, the Sage Payment Solutions can be used with American Express, Discover, Diner’s Club Cards, etc. and they provide a complete line of credit card processing terminals if you need point of service processing capabilities for your business. Their complete suite of product line comes with payment processing virtual terminas, shopping carts, an electronic check processing service, paper check processing, and various other merchant services that can help your business grow to its full potential. I’ve been trying to close my account with this company. I had to close my bank account to get away from this company. DON’T use them. AVOID at any cost!!!! Excellent service. Previous review is not what my experience has been. Highly recommended. Saved me thousands of dollars per year. This is one of the WORST credit card processing company. We FAXED 90 days cancellation notice in May, and they did not cancel our contract, and kept charging me. When I called, they said, they never received fax, and account was automatically renewed for 3 more years. Now they charged me $525 as early termination fee. PLEASE DO NOT USE THEM, THEY ARE A TOTALLY RIP OFF.